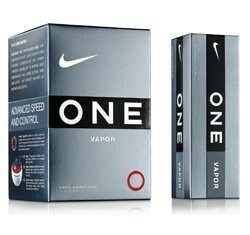 I like this Nike One Vapor for almost all golfers. It will not break your bank, and even better players will appreciate the feel and control of the ball. And HOLY COW is it long. Let’s take a look. The Nike One Vapor is a good compromise between those rock-hard distance balls and the premium tour balls. This ball goes very far with slower golf swings (80+mph) and has a decent spin on the greens. It’s a three-piece ball with a progressive density core and a seamless ionomer cover. The three-piece design helps maximize the ball speed of slower swingers resulting in more distance. What’s more is the ball spins well on the greens when struck solidly and has a nice soft feel. The ionomer cover is a little bit harder than the urethane cover of the Nike One Tour and Nike One Tour D.
The best thing about the ball is its durability. Even with those sharp spin-milled wedges, this ball will not get torn up like some of the premium balls like the Pro V1. For an all around golf ball that is above average in all departments (distance, feel, and control) but below average in price, I recommend these balls to all golfers.